We are Zooming to a Zero Wait List! Two donors have pledged $100,000 and will match all donations up to $100,000 to feed seniors on the waiting list! Individuals and businesses are helping us Zoom to a Zero Wait List! Big Thanks to AMAZING Kroger for sponsoring our race to Zoom to a Zero wait list. They gave $5,000! Kroger is a wonderful friend to our senior neighbors! Wow! 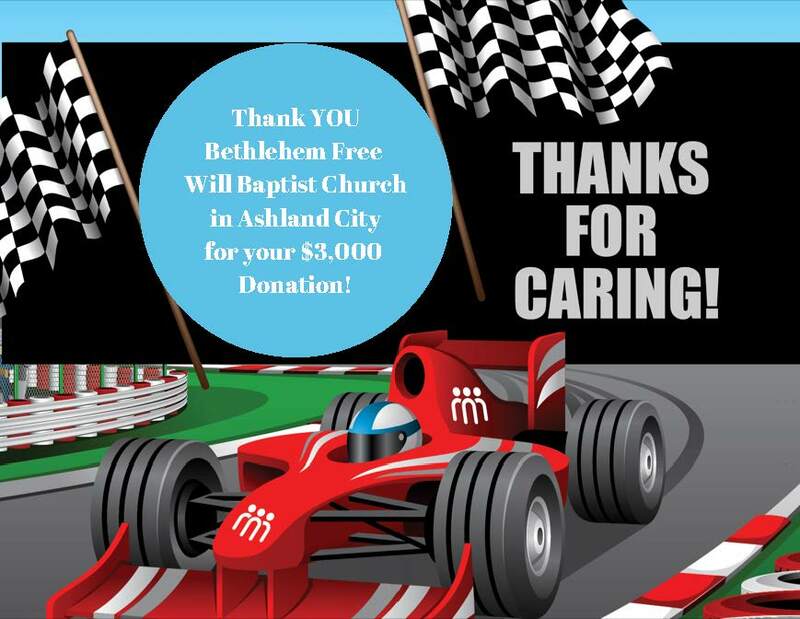 Bethlehem Free Will Baptist sold BBQ plates and made $3,000 to donate to our meal site in Ashland City! Thank you so much Free Will Baptist. We appreciate YOU! Rebel Hill Florist donated 350 smile mugs to our seniors this summer! It was so fun, and it made our seniors so happy. We sure do appreciate all Rebel Hill did to bring such joy to our seniors! Some pets of Meals-on-Wheels are celebrating President's Day with treat bags put together by Whitt, a local high school student. He wanted his service project for school to help seniors' pets! Candy is looking very forward to her treats! Her pet Mom Brenda who receives Meals-on-Wheels from us made sure Candy was dressed in her sweater for the picture. Isn't Candy just too cute? Pets provide so much companionship for seniors. Our amazing Meals-on-Wheels community of volunteers wants to help seniors and their pets too! We love our amazing friends at Walmart! They have given us grants in 2015, 2016, and 2017 that have helped us serve an additional 16,968 meals! Thanks so much Walmart for caring about our precious seniors over the last three years. You truly make a difference in your communities. We have been so blessed by your generosity! 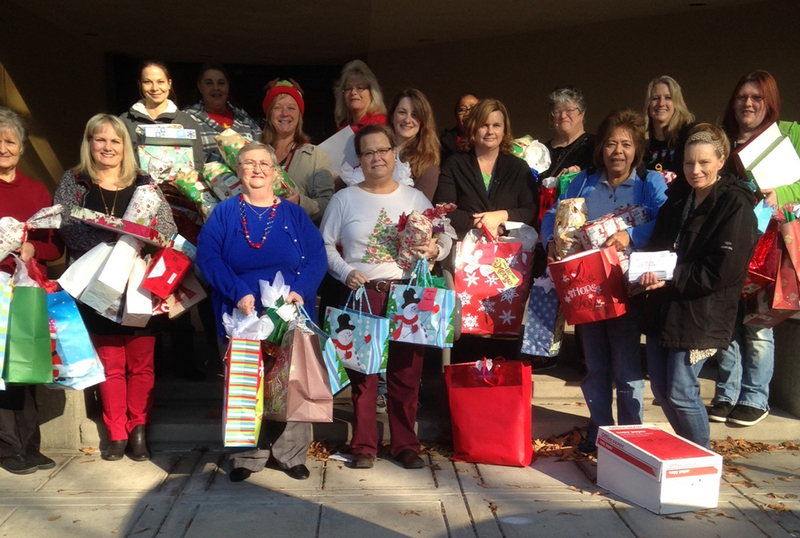 We have had several companies donate Christmas presents for our seniors who will not receive any presents. We have one wonderful company who did nearly 1,000 Christmas cards for all of our seniors! It is so much fun to play Santa and see how happy it makes our seniors. 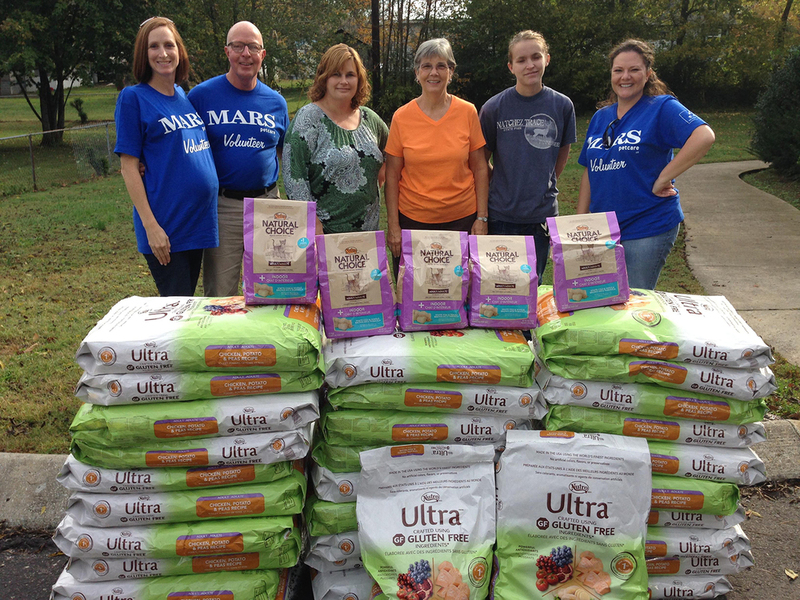 We delivered in October over 10,000 pounds of donated pet food from Mars Petcare to the pets of our seniors. We know pets are often the only family of seniors so we want to make sure they have food also. Recently, the Titans came to help us pack meals. They always bring so much enthusiasm for our seniors! One of our pet food deliveries! Love, Love our sweet friends at Walmart! They have given us grants in 2015 and 2016 that have helped us serve an additional 11,313 meals! Thanks so much Walmart for caring about our precious seniors. You truly make a difference in your communities! Our amazing friends at Sprouts gave us a $10,000 grant for our seniors in Murfreesboro! Sprouts just opened their store in Murfreesboro in the fall, and what a great first impression they made in the community by helping vulnerable seniors! Thanks so much Sprouts! We appreciate YOU! October is AniMeals, our partnership with Mars Petcare. We have been delivering donated pet food from Mars for four years, and we delivered our 100,000th pound in October. Around 25% of our seniors have pets, and we serve approximately 400 dogs and cats along with our precious seniors! In November Titans players, cheerleaders, and the wives of players and coaches helped pack and deliver meals to our seniors. What a phenomenal group!! They brought so much joy to our seniors!! We are now readying for Christmas and thanks to so many wonderful community groups and individuals, all of our seniors will have Christmas cards, and our most lonely seniors without families will receive a Christmas present! What have we been doing this summer? We have been delivering meals as usual all summer and appreciate all of our volunteers who faithfully come to deliver despite very hot and humid days! We were so excited to be on a news story on Channel 2 in July! Walmart helped pay the cost of 5,657 meals during the course of a year long grant which ends this month! Way to go Walmart for caring for the seniors in your community!! We appreciate you!! Spring is here! We are celebrating with participating in the nationwide March for Meals campaign bringing attention to meals-on-wheels programs across the country. We are having all sorts of fun events at our sites from bake sales to restaurant weeks to even a concert at the Bluebird!! Fall is a Blast!! having so much fun! We partnered with our amazing friends at Mars who donated over 11,000 pounds of pet food to deliver to the pets of seniors! We even had Channel 5 do a story about it! Check it out at the following:http://www.newschannel5.com/news/local-news/meals-on-wheels-delivers-pet-food-to-seniors-in-need. The super cool girl scout troop 2726 made decorated pumpkins and Thanksgiving cards for us to give to our seniors. Our Manager in Pegram made some adorable volunteer thank you cards! Our wonderful staff and volunteers continue to bless us every day!! We delivered over 75,000 meals in June, July, and August! Our volunteers continued doing their awesome work of helping our seniors feel loved and cared for by their community. 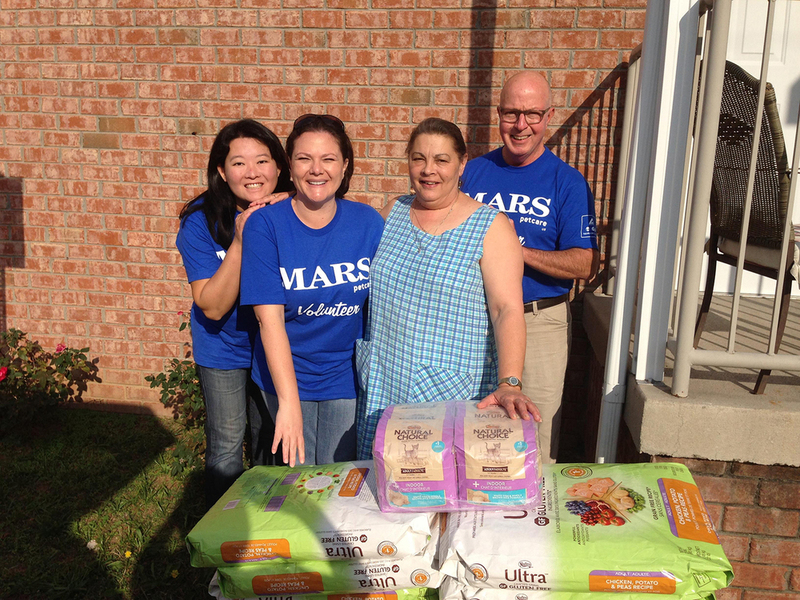 Our wonderful friends at Mars donated over 10,000 pounds of pet food we delivered in August to our seniors with pets! We had our first ever fundraiser by a fitness club! Sports Village Fitness in Lebanon raised nearly $5,000 in one weekend to help vulnerable seniors in Lebanon needing Meals-on-Wheels. Awesome! Big Thanks TO fairview chamber of commerce! Great food, friends, family and fun were all at the Taste of Fairview hosted by the Chamber of Commerce to benefit Meals on Wheels. The surprise guest was the Hamburgler who didn't steal any hamburgers but did pose for pictures! Charlie "the money" dog" is ready for the Big Payback! Click on the link below to see who he is giving to! Our Volunteer Charlie cunningham 95, WWII Fighter Pilot, delivers meals in his silver mustang! Check him out on Channel 4 News! 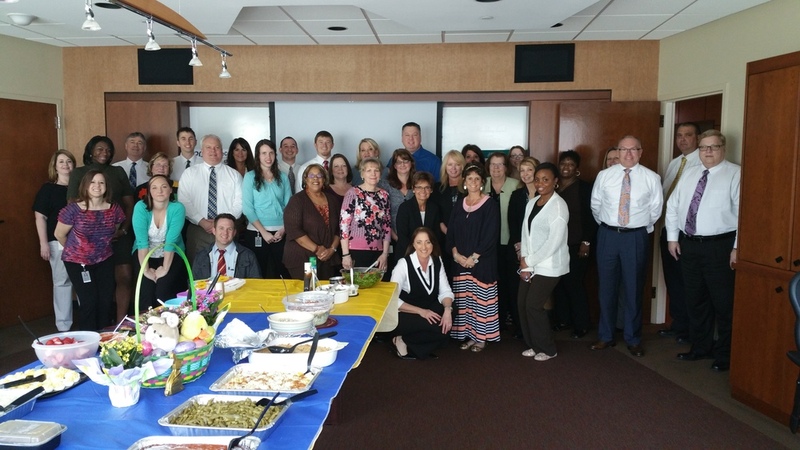 EAster bunny (Community Health systems) brings cards and eggs! Community Health Systems was an awesome Easter Bunny this year for the seniors in Franklin! The Home Care Division made Easter cards and their kids decorated plastic eggs for our seniors. The eggs are ADORABLE! We love you CHS! Thanks for brightening the day of our seniors! Woof! Woof! 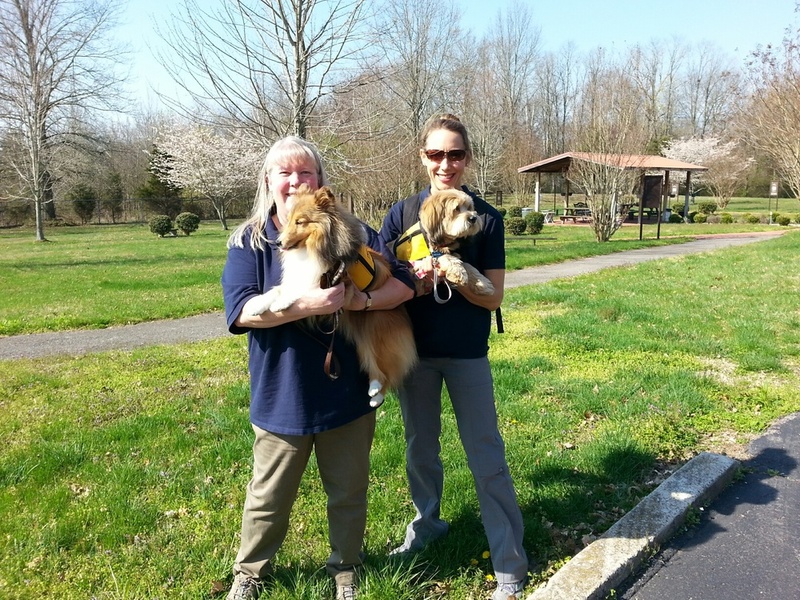 Pet therapy dogs come deliver meals-on-wheels! 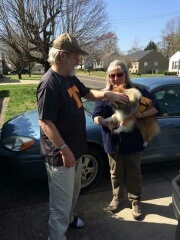 Meals on Wheels in Clarksville was barking happy today! Dixie and Brave from Tender Paws Pet Therapy along with their "humans" Kathy and Abby, came to deliver meals today to our seniors. The seniors LOVED it! Titans come for March for Meals week of champions! Wow! How much fun did we have! Justin Hunter, T-Rac, and the cheerleaders came to meet the seniors at the St. Clair senior center in Murfreesboro and to deliver meals next door at Westbrook Towers. March for Meals is the nationwide awareness and fundraising campaign for Meals on Wheels programs. Mrs. Virginia, and Jerry also known as the Governor who received the meals at Westbrook said it made their day meeting the Titans!! Thank-YOU Titans for making each senior you talked to feel special. WE had a super fun visit!! Check us out on Titans Online. coming soon! the great payback! Mid-Cumberland Meals on Wheels will be participating in the Great Payback on May 5th! We are so excited! This is our first time to participate! A Big Thanks to AARP in Murfreesboro for donating to Meals-on-Wheels! Mid-Cumberland Meals-on-Wheels and the Nutro Company delivered over 15,000 pounds of dog and cat food to our seniors with pets in October. Even the pets received treats for Halloween! The Nutro staff also donated $1,000 of their own money to buy personal care items for our seniors! What an awesome company! We love them! Evelyn has volunteered for over 30 years and delivered over 30,000 meals for Meals on Wheels! She is nominated for the Governor’s Volunteer Star Award.